They might say that this is the Year of the Pig, but as far as I’m concerned 2019 will be the Year of the Beast, with the hugely popular mobile title, Fire Emblem: Heroes, finally getting beast units as of earlier this month! The first confirmed units (all from the Radiant Series) will be Tibarn, Leanne, Reyson and Nailah. These are all great (especially Tibarn), but this got me thinking though … what fluffs, birbs, or dergons did I want to come to the game? After all, if you include the sprinkling of beast units over the more recent titles, there’s a fair few to choose from. So, here you go, my five picks of beasts I want to see in Fire Emblem: Heroes! Situated in Prestwich, Tri-Heart Interactive is a community driven video game development company that alters the game’s development based on the feedback they receive from the public. Their ambition is to let their fanbase and newcomers to the video game fandom to feel like they are actually included in the aforesaid game’s development. Their current project is a game of our audience's interest called, "The Otterman Empire"
Kickstarter is a hit and miss, it’s a mixed bag and it’s responsible for successes such as Rad Rodgers, Shovel Knight, Undertale, and Shantae: Half-Genie Hero (in spite of it’s inferior to its predecessor, Shantae and the Pirate’s Curse). There are times when some indie video game developing teams manage to meet the promises which they’ve set out to do in the first place and there are a few disgraceful rotten apples that didn’t bother to deliver the physical or digital backer rewards. I’m looking at all of you, Dante Basco, Jonah Feingold and the movie team behind Bangarang: A Short Film Before Rufio! Aside from Mighty No. 9 and Yooka-Laylee, this monstrosity of a horrendously mediocre film will be forever be named, shamed and frowned upon. If Dante Basco, Jonah Feingold and the film team have the gall to show their dishonourable faces on Kickstarter again in the future, you can bet I won’t be supporting them whatsoever under no circumstances. As a result, potential and future backers refuse to trust Kickstarter with their hard-earned money. When I take my current frustrating experience as a backer with Bangarang: A Short Film Before Rufio into account, I can’t say I blame them. Therefore, this is why I usually back projects at the last minute, if not never at all and why I’m, admittedly, still sceptical about Griff the Winged Lion due to how slow it’s raking in cash by the dozen at the moment. It depends on what the project is about. About Vulpine: Vulpine is a charming open-world game where you survive as ridiculously well-armed animals. Explore beautiful environments to hunt for food, gather resources, and search for signs of lost civilization. However, nature is not as peaceful as it seems to be... Ferocious monsters and endless dungeons stand in your way. Gear up and arm yourself to the teeth to take back your world as one of many different animals: fox, wolf, bear, rabbit, and more! Play solo or hunt as a pack with your friends! GF Extra Life Kick-off Event - Sat. 7/30 All Day! Live! Raffles! We're on a very important mission to save kids and they need your help. The Children's Miracle Network is an amazing foundation that helps kids and doesn't ask for money in return for their help. We're asking for your donations in exchange for some fun gaming entertainment over the coming months, culminating in a weekend full of contests, giveaways, dares, and more all done live on our Twitch stream page. Extra Life has raised more than $22 million to help children's hospitals provide critical treatments and healthcare services, pediatric medical equipment, research and charitable care. It's our sincere hope that you'll find it in your heart to support our efforts with a monthly pledge or one-time gift that will go directly to Children's Miracle Network. Last year we raised $750! This year we're setting our sights even higher with a $2,000 level goal! The team we've registered to be a part of, Furs For Life, has raised more than $4,000 already this year, and has raised over $10,000 total as a team over the years. 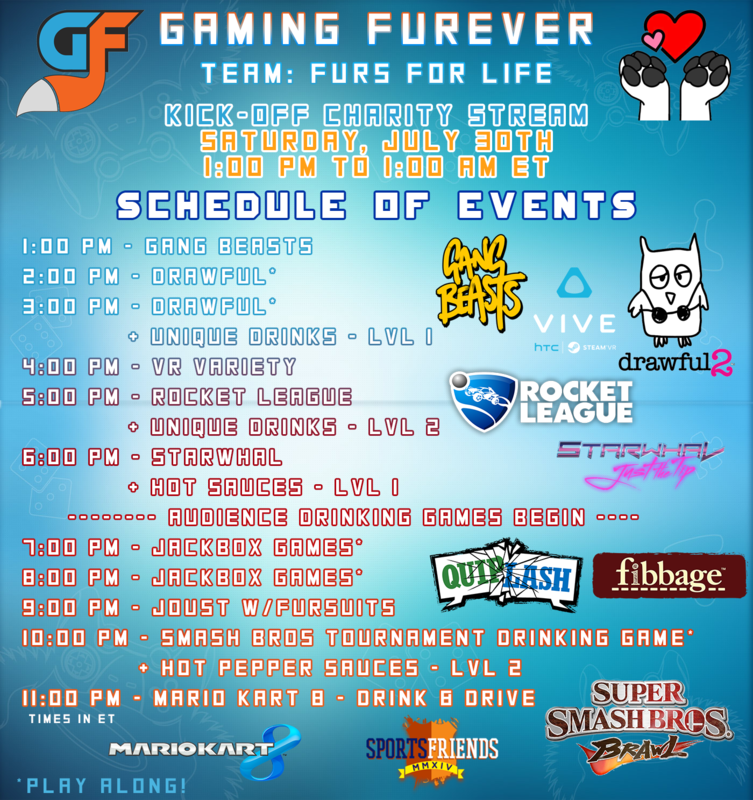 Gaming Furever is hosting a special "Kick-Off" stream on Saturday, July 30th, where staff members JoJo, Taki, Janie and special guests will be participating in playing fun games, taking crazy dares, and helping raise more money for this very special organization. We'll be hosting bi-weekly streams during the Fall, all leading up to the official Extra Life Day Stream in November. (Note that all money goals are for the whole campaign leading into November, but dares/events will be added if necessary and as goals grow higher. Watch the Twitch Stream on 7/30/16 Starting at 1 PM EST! From the creator of Home is Where One Starts... comes The First Tree, a third-person exploration game centered around two parallel stories: a fox trying to find her missing family, and a young couple dealing with a tragedy in theirs. Players take control of the fox on a poignant and beautiful journey that crescendos at the source of life, and perhaps results in the understanding of death. Along the way, players uncover artifacts and stories from the young couple’s life as they too become intertwined in the fox’s journey towards The First Tree. The game is currently in development and is set to release in early 2017 on PC and Linux, to start. The sequel to the Wii U hit Freedom Planet is in development over at Galaxy Trail. Announced in December, the game has a planned beta release of mid-2017. We'll keep you updated on progress and when that beta becomes available. Join the heroes of Avalice as they face their greatest challenge yet! An ancient terror has emerged from the depths of the ocean. Merga, a water dragon from Avalice's oldest and deadliest war, has been freed from her crystal prison as a consequence of the Kingdom Stone's destruction. War is imminent once again, but this time, the heroes are split between sides. As friendships are tested, will the girls stand united when Bakunawa rises? We recently were able to grab an interview with Trent Custers, the Founder, Creative Director, and Game Designer of League of Geeks, a studio designer an upcoming indie title called "Armello", which features an anthropomorphic cast of characters. Check out what he had to say about the work so far on the game, and some special details about the story, characters, and furry influences. Night in the Woods is an upcoming adventure game from Infinite Fall, featuring dozens of animal characters, a hand-drawn world filled with things to interact with, and an intriguing story filled with wit. After a successful Kickstarter campaign in 2013, the three-person team is finally getting close to releasing its creation, with a planned release on PC and PS4 this year. Welcome to the New Gaming Furever! Welcome to the brand-spanking new Gaming Furever! We've changed a lot around here, including what we're going to try to be to the fandom moving forward. For years, we've had a database of furry game information. While this was cool to have as a reference for those who may not know all there is to know about furry games and their history, it was a large undertaking for the small staff we have. Thankfully, the furry gaming scene continues to grow at an increasing rate, and we're moving our focus to covering updates to those games which include anthropomorphic characters, or especially animal-driven titles. We are also reinvigorating our community scene! We want to have social hangouts, gaming meetups online, tournaments, and more! That's where fun happens and friendships are built, and we want to help facilitate that. We're bringing in staff with a passion for gaming and a knack for being friendly and peppy, and with experience running gaming events & tournaments online and in the real world. This should help keep things from getting stagnant around here less often. Out with the old, in with the new! Speaking of new, we're very excited to welcome a brand new staff team here at GF. Instead of having a huge stable of staff, we decided to go with a smaller, more dedicated team who can bring their own individual experiences to the site in awesome ways. We hope you'll get to know them as they spend their time on the site, heading up social gaming events, and more! So there you have it! Follow us here on the site for news, a growing community of gamers, and more! Invite your clan/guild to set up a group over on the community, find local furs to have RPG meet-ups or hangouts, make friends and chat em up, upload your favorite screenshots or personal art to the community, set up your profile with your gamertag or PSN name and more! There's lots to do! Make GF your own!